The data acquisition in electric power system is very important and includes a lot of areas such as substation. Digital substation is one of the key parts of smart grid and the network of process layer is an important foundation for smart substation which is related to the reliability and real-time of data acquisition and switch control. The type of message of process layer which include GOOSE (General Object-Oriented Substation Event), MSV (Multiple Sample Value) and synchronization with network will be the content of data acquisition in this technical article. As the trend of development about the power system is along the large capacity, high voltage, extra-high voltage and the same about the device is along the small, smart and high-reliability, the electric transformer is widely used for its many advantages such as small size, light weight, good capability of anti-electromagnetic, wide dynamic range which is not easy to saturation, simple insulation structure and easy to the transmission of digital signal, etc. The merging unit (MU) is connected with the electric transformer and is used to transmit the sample value to the Intelligent Electronic Device(IED). It is not only useful to simplify the design and reduce the cable and area of substation but also can promote the development of smart substation and provide strong support to the construction of smart grid. With the construction of smart substation, the requirements about the merging unit are increased and the urgent need to develop a new type merging unit to meet the requirements of the smart substation is generated. The process layer involves data transmission and control of primary equipment such as data sampling and trip of protection. The research about the scheme of network structure of process layer is important and it determines the stability and reliability of smart substation. The type of message of process layer which include GOOSE (General Object-Oriented Substation Event), MSV (Multiple Sample Value) and synchronization with network will be generalized. The scheme of process layer network with different combination of the GOOSE and MSV will be discussed. The unite scheme of GOOSE, MSV and synchronization with IEEE1588 is researched, the scheme of hybrid mode which fits the requirements of relay protection of smart substation will be presented in detailed. The VLAN and GMRP technology which is used to divide the network of process layer to reduce the load of network will be proposed. The devices of process layer in smart substation include electronic (optical) transformer, merging unit, intelligent operation device (intelligent switch). The typical messages are GOOSE, MSV (multiple sample value) and synchronization with IEEE1588 may be included. The sampling message in substation mainly based on the standard of IEC60044-8/7, IEC61850-9-1 (shortened with 9-1), IEC61850-9-2 (shortened with 9-2). The digital substations constructed earlier are mainly based on 9-1 which is abolished now. The 9-2 which is flexible and convenient to meet the requirements of the project but need the higher performance of the device becomes the unique standard of the sampling in process layer. The IEC60044-7 / 8 standard is also in use, primarily in accordance with the “Technical Specifications of Relaying Protection for Smart Substation” which require the transition of sampling data from the merging unit to protection device through the direct connect which like point to point. The tripping network in smart substation is GOOSE. The principle and implementation are the same with the digital substation. The difference is that the transition of GOOSE is through direct connection not the network which is used to meet the requirements of standard of “Technical specifications of relaying protection for Smart Substation”. The network of IEEE1588 is included when the synchronization with IEEE1588 is used. This network can be attached to the network of GOOSE or MSV and need no additional electrical connections. The only requirement is that the switch should support the standard of IEE1588 and the master clock should be provided separately. The topology of process layer network is the same with the bay layer which can divide three types such as star network, ring network and bus network. Among these three types, the reliability and cost of the bus network is the lowest but the delay is large. The delay of star network is the lowest and the reliability and cost is medium. The cost and reliability of ring network is the highest and the delay is very large also. According to the pilot project of smart substation in China, most of them choose the star network as the topology of process layer to achieve the optimization of performance and cost. The star network is also used in most high voltage substation. The communication of process layer include the digital sampling which involves the use of electric transformer and merging unit and the network of GOOSE which involves the use of intelligent operation device or smart switch. The process layer network which concerns the data source and the control of switch play a important part in the stable operation of substation. There is a need of the research of process layer network to choose the most safe, stable and economical scheme to make sure the security and stability of the substation. The direct connection of MSV and GOOSE (also known as point to pint) is similar to the cable connection in traditional substation. The difference is that the cable is replaced by the fiber. The scheme of Figure 1 can ensure the reliability of data transmission but the sample value can not be shared. The direct connection needs the IED provide more network ports or optical ports and more fiber, the cost is very high. If the merging unit or intelligent operation device are installed beside the primary device, this scheme is suitable, but if the devices are centralized in the supervision room, this scheme is not suitable. At present, this scheme is not used in the project. The scheme cannot realize the sharing of sample data but can reduce the use of fiber as the trip is realized through the network of GOOSE. It meets the requirements of the standard of IEC61850 and the trend that the trip of intelligent switch through the network of GOOSE. It reflects the commonality and expandability of the standard of IEC61850. This scheme is widely used in the digital substation constructed earlier especially the substation of 220kV. The practical test show that the trip through the network of GOOSE can meet the requirements of real-time even in the heavy load. This scheme only focuses on the network of sampling and can realize the share of sampling value. This scheme is widely used in the digital substation constructed in early stage because of the GOOSE is not widely promoted as the performance and reliability of GOOSE is not tested by the project. In early stage, the focus is on the application the electronic transformer. Now, during the construction of smart substation, this scheme will be used in the upgrade of traditional substation. The scheme of the network of sampling data and GOOSE meets the requirements of process layer communication in the standard of IEC61850. 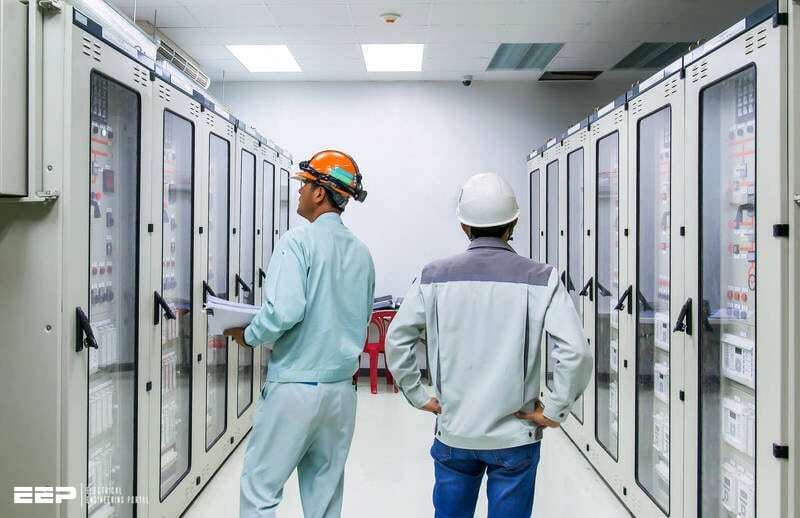 he network of sampling which can realize the sharing of data and the network of GOOSE which can realize the trip through the network can meet the development of substation automation and the requirements of process layer of smart substation. The structure of this scheme is complicated and the number of switch required is large especial the network is redundant which will increase the investment. The type of switch which meets the requirements of the standard of IEC 61850 is few and the networks of MSV and GOOSE have the higher requirements of performance. The switch used in process layer is expensive and this is the reason that the cost of digital substation is large. At present, the scheme is widely used in digital substation and there is a lot of practical experience. The synchronization of IRIG-B is used in this type of substation. This scheme is similar with the scheme of Figure 4 above except the synchronization. The accuracy of synchronization with IEEE1588 is less than 1 ms and can meet all the requirements of substation. The realization of synchronization with IEEE 1588 through the network has no requirements of additional connections which can reduce the cost. The type of synchronization with IEEE1588 is promoted and will be the trend of synchronization in smart substation. This scheme has the higher requirements of performance of switch equipment which should support the function of IEEE1588 and process layer device which should have the higher processing power and support the synchronization of IEEE1588. The bandwidth of 100M can not meet the requirement of this scheme and the gigabit Ethernet will be the best choice. The implementation of this scheme needs the process layer device to be updated and the type of switch which fit the requirements is few, the product which is more expensive is new produced and the stability and reliability need verification in project. This scheme is already used in substation of 110kV of DaLv in ZheJiang province and substation of 220kV of MaShan in LiaoNing province, China. This scheme which the sampling and trip used for protection through the direct connection and the other implementation such as measure and metering through network is a hybrid of schemes discussed above and is generated according to the practical implementation of project. This scheme is mainly on the consideration of the requirements of security and reliability of protection to avid the failure of protection caused by the network and is also defined in the “Technical specifications of protection for smart substation” published by State Grid Corporation of China. This method has the high requirements of devices in process layer and bay layer. The merging unit and intelligent operation device should add a lot of net ports to meet the requirements of direct connection. At present, the fiber ports need eight at least and the other devices such as bus protection need more. The devices which meet the requirement of process layer and bay layer are in developed and have not used in the project. But the first batch of smart substation is designed according this scheme. This method which meets the requirements of standard of State Gird Corporation of China and the basis of digital information, standardization and network while improving the security and reliability of protection will be the major scheme in future. The communication in process layer which includes the transmission of sampling value of current and voltage, the status information of primary device and the signal of protection and control device is real-time and has large information. In order to reduce the load of switch, to improve the security of network and increase the flexibility of management, convenience of maintenance and the expansion of substation, the virtual LAN should be implemented to filter the packets of the port which are not needed. The VLAN (virtual local area network) and GMRP (Group Multicast Registration Protocol) are the two methods widely used. The load of the network of sampling value is very heavy especial when the sample rate is high, in order to reduce the number of packets retransmitted by the switch and to improve the reliability of the network, the devices in process layer should be divided into several virtual LAN. The unite network of MSV, GOOSE and IEEE1588 is also need to be divided in order to avoid the master clock receiving the other messages which are not synchronization message of IEEE1588. The technology of VLAN is widely used to filter packets in digital substation but the configuration of switch is complicated which increase the complexity of construction and maintenance. Once the structure of network changed such as reduce or add device the virtual LAN should be configured again. GMRP is a multicast registered protocol based on GARP (Generic Attribute Registration Protocol) which is used to maintain the multicast registration information of switch. When a host wants to join the multicast group. It will send the join information. The switch receives the message and joins the port to the multicast group and sends broadcasting to the group of VLAN and then the multicast source will know the existence of new member. All the switches which support the GMRP can receive the register information from the other switches to update the local register information dynamically and can send the local register information to other switcher also. This kind of mechanism about information exchange can make sure the consistency of register information of the devices which support the GMRP in the same network. It is suitable to the sampling based on the mechanism of publish/subscribe and IEC61850-9-2 and the transmission of GOOSE. Compared with the VLAN, the implement of GMRP do not need the configuration of switch but the switch should support the GMRP. This method is more flexible compared with VLAN and can reduce the difficulty of construction and maintenance. Generally, the realization of VLAN which only need the configuration of switch is easy, but once the structure of network changed the VLAN should be divided again and the maintenance is complicated. Although the realization of GMRP involves the device and switch which should support the GMRP, it is more flexible and convenient to the construction and maintenance. Thanks for continuing with relevant application oriented articles on today’s technology advancements.Excellent .